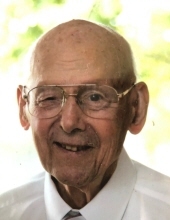 Celebrating the life of Edmund S. Mende Sr.
Obituary for Edmund S. Mende Sr.
Gowanda, NY - Edmund S. Mende Sr. 91, of Gowanda, NY passed away Thursday, September 13, 2018 at Orchard Heights in Orchard Park, NY. Mr. Mende was a WWII Veteran having served in the US Navy and he also was a Korean War Veteran having served in the US Army. great grandchildren and several nieces and nephews. He was predeceased by a sister Frances Dubaj. 17 at 11am at St. Joseph's RC Church. Rev. Fr. Dan Walsh Celebrant. Internment to follow in The Holy Cross Cemetery. To send flowers or a remembrance gift to the family of Edmund S. Mende Sr., please visit our Tribute Store. "Email Address" would like to share the life celebration of Edmund S. Mende Sr.. Click on the "link" to go to share a favorite memory or leave a condolence message for the family.